Since 2008, we’ve been bringing our community together around a crazy, positive dance floor with the freshest sounds from Kinshasa and Cartagena, Port au Prince and Nueva York, Oakland and Abidjan. We mix the old with the new, the city and the village, bombardinos and autotune. La Pelanga was born in Cali, Colombia during the Festival Petronio Alvarez de Musica del Pacifico. Your pelanguero family has collective roots in California, Colombia, Indonesia, Perú, China, México, the Phillipines, Canada, and Korea. Now we call Oakland our home. So you get the idea. Somos Pacífico, and this Saturday we celebrate. 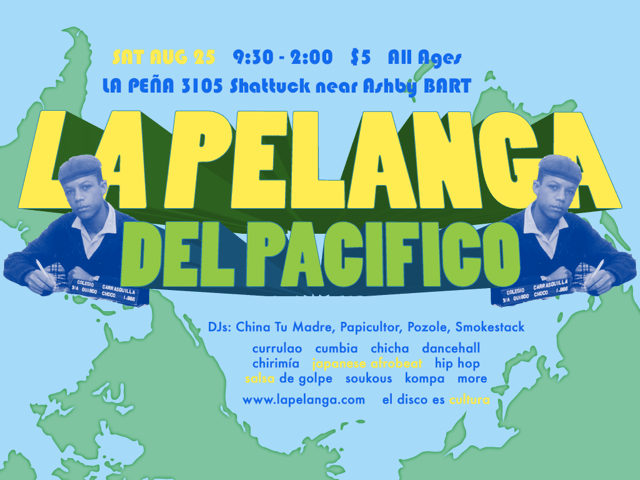 August 3rd: La pelanga japonesa! 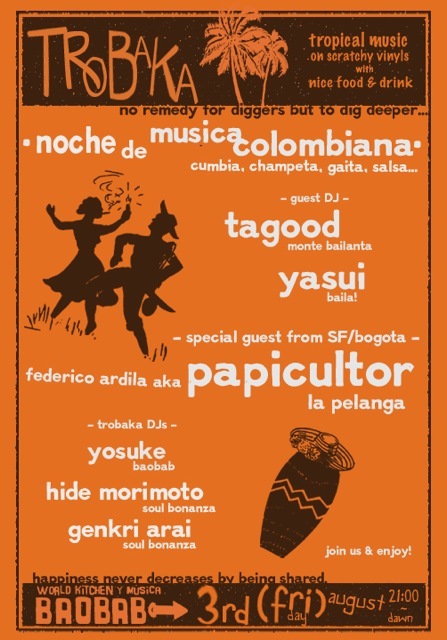 I’ll be representing La Pelanga at this Trobaka in Tokyo tonight. Come over to Baobab for some delicious Senegalese soul food, aguardiente, and a deep selection of AfroColombian music.